The Wine Rose Coat is an ornate circular coat that is made from a textured back-panel and rounds of openwork lace border. Simple and seamless construction allows for the coat to be altered to fit any size and style. The eye-catching texture and flattering lace makes this coat the perfect piece to wear to a party or formal event. The coat can be joined using your favorite brooch or clip, laced up the front using ribbon or ties, or tied around the waist using a tie or belt. Caron Simply Soft Solids, Plum Wine 2 skeins or any worsted/aran weight yarn. Size J/6.0mm crochet hook. NOTE: This pattern calls for 2 skeins of yarn, which will make a M size coat (which I am modeling in the pictures on the left). If you make a larger size coat, you will need to purchase more yarn! Important! The back-panel is a rectangular piece worked in rows. 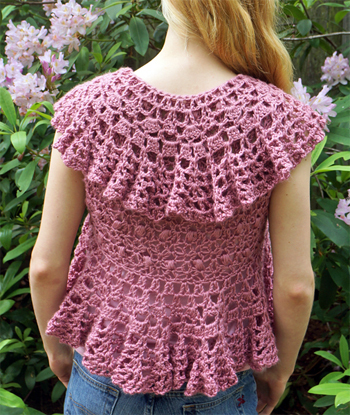 When you are crocheting make it wide enough to reach between your two shoulder blades (your starting ch determines this length), and tall enough to reach from your neckline to your waistline (row repeats). Row 1: Dc in 4th ch from hook. *Sk 2 ch, sc in next ch. Sk 2 ch, (Dc, ch 1, dc) in next sp. * Repeat from * to * to end. Ch 2, turn. Row 2: Sc in first ch-1 sp. *(Dc, ch 1, dc) in next sc. Sc in next ch-1 sp. * Repeat from * to * to end. Ch 3, turn. Row 3: Dc in first sc. *Ball st in next ch-1 sp. (Dc, ch 1, dc) in next sc. * Repeat from * to * to end. Ch 2, turn. Rows 4 - 17: (Row 2, Row 2, Row 3) Repeat rows in parentheses 4 times. Repeat Row 2 twice. Proceed to STEP 2. For a modified size, repeat rows in parentheses until your back-panel is long enough to fit you. Finish off by repeating Row 2 twice. Now we begin working in the round. At the end of the last Row repeat for the backpanel, ch 1 and turn. Sc across entire edge. Fsc* 12, make 1 sc in corner of Row 1 of the backpanel. Sc across edge of Row 1. Fsc 12, join with sl st to first sc. 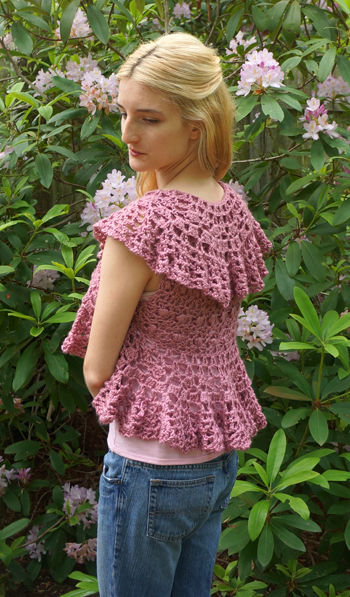 You may make as many Fsc (foundation single crochet) stitches you need to fit. 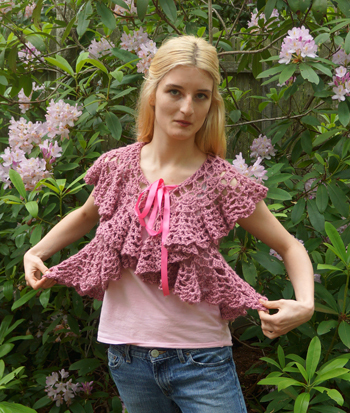 You do not want the armholes to be too large, but you should have enough space to move your arm around freely without restriction. 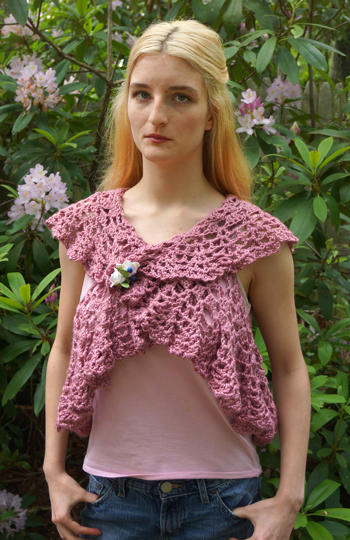 *See "Glossary of Terms" to learn how to make a "Foundation Single Crochet," otherwise denoted as "Fsc." After securing each strand of FSC to the corner of the piece your backpanel will curl in a bit. This is completely normal and should not worry you a bit! Round 1: Ch 4, make 1 dc in same st as joining. *Ch 1, sk 1 st, make (1 dc, ch 1, 1 dc) in next sc. * Repeat from * to * around. Join to 3rd ch of ch 4 to join. Round 2: Make 1 sl st into each of the following (next ch-1 sp, dc, ch-1 sp). Ch 4, make 1 dc in same st as joining. *Ch 2, skip next (dc, ch 1, dc) make (1 dc, ch 1 , 1 dc) in next ch-1 sp. Repeat from * to * around. Join to 3rd ch of ch 4 to join. Repeat from * to * to end. Make 1 sc into next dc, picot, 1 sc into next dc. Ch 2, sl st into top of ch 3. Note (from my 3rd pattern test): I ended on 5 dc shell next to beg shell and had to squeeze in extra (sc, picot, sc). Round 4: Ch 1, sc in same st in joining. Ch 3, sk 1 dc, make 1 sc in next dc. Ch 3, make 1 sc in nxt ch-2 sp. *Ch 4, sk nxt (sc, picot, sc) make 1 sc in nxt ch-2 sp. Ch 3, sk next 2 dc, sc in next dc. Ch 3, sk nxt 2 dc, sk in nxt ch-2 sp. * Repeat from * to * around. Sl st in first sc. Round 5 : Sl st in nxt ch-3 sp. Ch 3, make 2 dc in same sp. Ch 1, make 3 dc in nxt ch-3 sp. *(Ch 1, make 4 dc in nxt ch-4 sp. Ch 1, make 3 dc in nxt ch 3 sp. Ch 1, make 3 dc in nxt ch 3 sp. )* Repeat from * to * around, ending with Ch 1, make 4 dc in next ch-4 sp. Ch 1, sl st to join to top of beg ch-3. Round 6: Sl st across next 3 dc, and sl st in next ch-1 sp. Ch 4, make 1 dc in same sp. *Ch 4, sk nxt 4 dc, make (1 dc, ch 1, 1 dc) in nxt ch-1 sp. Ch 3, sk nxt 3 dc, make (1 dc, ch 1, 1 dc) in nxt ch-1 sp. Ch 3, sk nxt 3 dc, make (1 dc, ch 1, 1 dc) in nxt ch-1 sp. * Repeat from * to * to end of round, ch 4, join with sl st to top of ch-3. Round 7: Sl st in nxt ch-1 sp. Ch 4, make 1 dc in same sp. *Ch 2, make 1 dc in nxt ch-3 sp. Ch 2, make (1 dc, ch 1, 1 dc) in nxt ch-1 sp. * Repeat from * to * to end of round, ch 2, make 1 dc in last ch 3 sp, ch 2, join with sl st to 3rd ch of beginning ch 4. Round 8: Sl st in nxt ch 1 sp. Ch 4, make (1 dc, ch 1, 1 dc) in same sp. *Ch 2, make 1 dc in nxt dc. Ch 2, make (1 dc, ch 1, 1 dc, ch 1, 1 dc)in nxt ch-1 sp. * Repeat from * to * to end of round. Ch 2, make 1 dc in nxt dc, ch 2, join with sl st to 3rd ch of beginning ch 4. Round 9: Sl st in nxt ch-1 sp. Ch 4, make 1 dc in same sp. Ch 2, make (1 dc, ch 1, 1 dc) in nxt ch-1 sp. *Ch 2, sk nxt (2-ch, 1 dc, 2-ch). Make (1 dc, ch 1, 1 dc) in nxt ch-1 sp, ch 2, make (1 dc, ch 1, 1 dc) in nxt ch-1 sp. * Repeat from * to * around, ch 2, join to 3rd ch of beginning ch-4. Round 10: Sl st in nxt ch-1 sp. Ch 4, make 1 dc in same sp. Ch 2, make (1 dc, ch 1, 1 dc) in nxt ch-2 sp. Ch 2, make (1 dc, ch 1, 1 dc) in nxt ch-1 sp. *Sk nxt ch-2 sp, make (1 dc, ch 1, 1 dc) in nxt ch-1 sp. Ch 2, make (1 dc, ch 1, 1 dc) in nxt ch-2 sp. Ch 2, make (1 dc, ch 1, 1 dc) in nxt ch-1 sp. * Repeat from * to * to end of round. Join with sl st to 3rd ch of beginning ch 4.